You might think this Maize but I thought Ear of Corn Inflatable for Autumn a more commonly understood description. I do agree the multi-color kernels were far more Fall-like than a brilliant yellow ear of corn would have been. 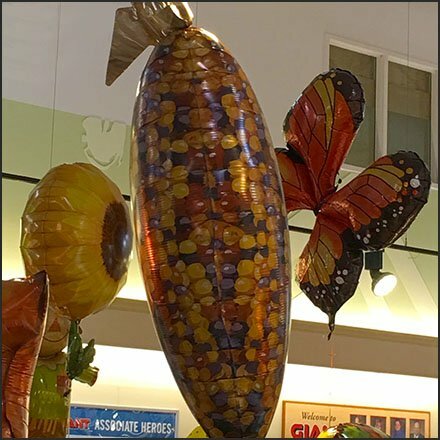 Other Seasonal Inflatables were in evidence for Visual Merchandising as well as purchase, but the most distinctively shaped was the Ear of Corn Inflatable for Autumn. Consider from various distances in the gallery of images. Seen at Giant, Bartonsville PA.